FOXBOROUGH, Mass. 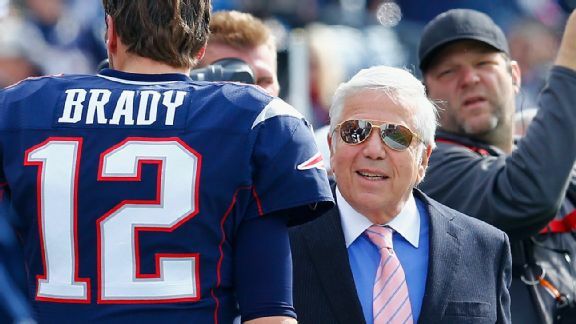 -- Monday will mark the 25th anniversary of Robert Kraft becoming owner of the New England Patriots, and looking back at what he said that day, he couldn’t have been more prescient. Since that time, the Patriots have totaled 31 playoff wins, 18 AFC East championships, 9 AFC championships and 5 Super Bowls, becoming the most dominant team in the NFL. The 31 playoff wins are the third most for any ownership group, but no one has ascended the ranks as quickly as Kraft. The Rooney family has a record 36 playoff wins over an 86-year span, while the publicly owned Green Bay Packers have 34 playoff wins over 100 years. In an interview with ESPN, Kraft reflected on the upcoming 25-year anniversary of becoming Patriots owner. “In life, I think it’s important to dream big. My dream was to be able to own the NFL franchise that I adored and was passionate about. I wanted the privilege of trying to run it in my own hometown. [That day] a lot of things came together,” he said. “It’s unbelievable to me; I just sit back and pinch myself, that we were able to do it. [Tom] Brady and [Bill] Belichick get a lot of the credit, as they deserve to get. Really, the hidden asset in all of this is the fan support we got. If told that day the Patriots would go on to a dynastic run of success, Kraft said he wouldn’t have believed it. “One of my strategies in life, no matter what I do, is try to collect good people. And then have continuity. Because in life you have a lot of things that happen that cause tension or other things. You try to work your way through it and keep stability. I’m proud of what we’ve been able to do here,” he said. Because Kraft owned Foxborough Stadium, where the Patriots played their games, it positioned him well to buy the Patriots. Kraft had bought the stadium for $25 million, and he was offered $75 million so then-Patriots owner James Orthwein could break the lease, which would have opened the door for the Patriots to move to St. Louis. Kraft recalled a conversation he had with Myra about taking the $75 million, and then hoping to buy a different NFL team. “I just thought back to the Braves leaving. A part of me died when that happened. I also thought about what it’s like in this area. The political people don’t finance stadiums. Life might’ve been a lot different if we hadn’t stepped up. I’m really glad we had the privilege to do it. Here are the NFL owners with 200 Wins and a .600 win percentage. “People are always the most important thing: We hire people on the basis of integrity, character and loyalty. That’s what I need to be able to build from,” he said, when asked how he’s found the sweet spot between business and finding the right people. Kraft called the Patriots' first Super Bowl victory the biggest high in his ownership tenure and said the most challenging day was turning down a lucrative opportunity to move the team to Connecticut in the 1990s, which ultimately led him to privately finance a new stadium in Foxborough that opened in 2002. Kraft reflected on his remarks on the day he purchased the Patriots, about how a football team can help bring a community together, sharing a story of a letter he recently received from a family from Vermont. Kraft was asked what he hopes his legacy will be. “That I love this community,” he responded. “What we do as a family and what our life is about is building bridges, bringing people together. I really feel that anyone who is born in this country has won the lottery. It doesn’t matter your ethnicity or the color of your skin: If you want to work hard, persevere and dream big, you have an opportunity to make it happen. “I look at this team carrying our family name, the way we do things, I hope people are proud and want to brand with us. And it makes the quality of their life better. I hope in a small way we’ve done that and brought pride and good will and good feelings. Then, the unique opportunity of what it allows you to do philanthropically, and how your players can go in and make an impact, and how our charitable foundation can also do that.